The curved lines of the wood accents gives this bell a cool, contemporary look. Inspired by traditional Asian design, our Emperor Series is intended to reflect balance, harmony, grace and beauty. Durably constructed, the best of the best, these are heirloom quality! The three-piece top adds a modern touch to this authentic, hand-hammered gong. 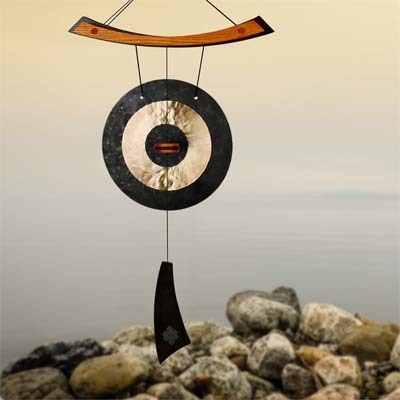 Designed with a windcatcher, hang this gong outside and let the healing come with every breeze. Black and cherry finish ash wood, hand-hammered bronze gong. 30 in. Overall Length; 15 in. Width; 10 in. Diameter Gong.